I love the Ruched Tulip Hem Skirt! I'm so into tulip shapes right now. Have a sweet weekend, dear fashion cupcake princess! Loving that Multiple Chain Necklace at Frankie's. I've been loving chain necklaces lately! Btw - All those events are in the upcoming week, not this weekend! Lol! You kidding? I would be passed out in a ditch by the time I got through!! So cool! I love the tree of life earrings! For two more entries, my fave piece in the store are J Brand's Stonehedge Grey Denim Jeggings. My fave jewelry piece is the Multi Chain Necklace in Gold and Black. I am a follower! Lovely giveaway dear! I also like the ruched tulip hem skirt - oh the outfit possibilities! I'm a FB fab of Frankie's on the Park. Oh yes and of course a follower! I think my favorite item would have to be the by boe multiple chain necklace in gold!! perfect for adding a little glam to a plain white t-shirt! I also love the natural gemstone necklace, soo pretty!! my favorite is the mixed metal and leather necklace. I'm actually such a fail at wearing earrings. I haven't in MONTHS. But they're pretty fabulous, I must admit! Very BAM. The leather and metal bracelets are fab! I feature all your giveaway on my blog. Love the multiple chain necklace in gold! Fabulous give-away... I love the cocktail ring watch in silver... such a versatile piece. I am obsessed with anything geometric right now and those are spectacularly, perfectly, exactly what I am loving. 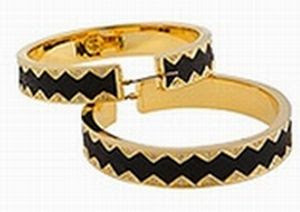 I love the leather studded bracelets! What a great giveaway! I wish I could participate! I love the Navy Ruffle dress -- so cute! And these earrings are absolutely darling. And of course I'm a follower, dear. Good luck to everyone! You do have the best give-a-ways! I love the green Splatter Paint hoodie! I'm a follower of this wonderful blog. Hi Darling! 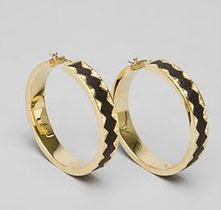 I love these earrings and I also love the pyramid hoops in black, fantastic giveaway!! What a great site you found! I love the patchwork denim shorts, they are so cute with the patchwork hearts on them! :) You always find great stuff. I always think of you when I see that TJ Maxx commercial where the lady says "Im a Maxxionista!". Ooh the jewellery is so lovely! thx for linked me..keep in touch yach..
Oh such gorgeous earrings! Makes me wish my ears were pierced! Great earrings! I could see these with so many different outfits. Frankie's on the Park has such cute pieces, loving the cocktail ring watch. Hey Erika! Those earrings are gorgeous!!! Thanks for this giveaway! Have to go the 5 entry route with these beauties. I am a follwer and I love the Fuchsia Sleeveless Dress! Beautiful giveaway ... too bad I can't join! SO gorgeous - good luck everyone! my fave item on the website are the initial necklaces. I am a follower of your blog and frankie's as well. earrings are really nice and classic. I'm already a follower of your amazing blog, and I would definitely like to enter! Awww what an awesome giveaway and site! I love the floral print dress from mm couture at Frankie's! I RT @prblms4loki and follow you on Google Reader! I love the pintuck floral dress! ;( bummer. i want these so bad! and even more so the coctail ring. its brilliANT! I love the Retro Floral Dress by Necessary Objects. So cute! Love the Cargo Pant by Blank. They look like they would fit just perfectly and go with just about everything! My favorite piece on the site are the earrings you are giving away. I sure hope i win. love the large initial necklace in gold! to cute! i am a follower as well! I like the cutout initial necklace in gold. This is my comment & I tweeted!! cream studded shorts! I'm a follower! love the mini leather charm bracelet. The Cocktail Ring Watch in Silver is adorable.